I could understand how he felt. He’s a contractor who makes low six figures. He is spending $6,600 on insurance premiums for a health insurance package with a $3,000 deductible and a $15,000 maximum out of pocket cap per year. He’s right. He doesn’t use his insurance. He pays for his procedures—such as testosterone injections—out of pocket, and he has no health issues at 52 years old. Since we’ve known each other for a decade and we are buddies I decided to tell him how much I pay for my health insurance. He looked at me with a mixture of hatred and humor. “I hate you!” he quipped. Our health insurance conversation occurred in 2015, a short four years after my decision to become Poor on Purpose. That year my friend was 52, I was 46. He made six figures and worked 50+ hours a week. I made $24,000 per year working 4-6 days per MONTH. He spent more money eating out each month than I actually earned! Yet, he was jealous of me, instead of the other way around. My friend has been divorced since 2005 and lives in a high-rise apartment in Dallas. His rent? $2,500 per month. I bought a 10-acre farm with some outbuildings and a small mobile home for $50,000. My rent? Zero. My friend drives a Mercedes SUV for about $650 per month plus $150 per month for insurance. His car expense is $800 per month, plus $80 per month in toll-road driving for a total of $880. I drive a 2006 Toyota Prius that I bought used for $3,000. My liability insurance is $35 per month and I pay no tolls. My monthly car expense is $35. His car gets 19 MPG, my car gets 46 MPG. My friend has TWO thermostats in his 1,300 square foot apartment. He has electric AC and heat. His average electricity bill is $180 – $220 per month. I have a wood burning stove and use zoned window AC units that I only turn on when I’m in the room. I also spent $5,000 installing a small solar array. Even though I live in a mobile home—which is essentially a tin can—my average electricity bill is $50 per month. My friend makes more than $76,452 per year. He also spends a lot more than $76,452 per year. That’s not his income. That’s what MY income was before I decided to become Poor on Purpose. I lived in a modest $140,000 home and drove “normal” new cars, instead of a Mercedes SUV. Notice that the list doesn’t include credit-card bills or other credit payments. I have never been a fan of revolving credit. It also doesn’t include luxuries like vacations or spa treatments. The FIVE major lessons I learned when I decided to be Poor on Purpose. 1. I would rather live in a mobile home on my 10-acre homestead than in an expensive house in a subdivision. In 1950, in America the average house size was 930 square feet. My two-bedroom mobile home is 880 square feet. Plenty of space, especially when you add 10 acres. 2. I can easily create a self-employment income of $2,000 per month living just about anywhere. I became a dog trainer. I live 2 hours outside of Dallas. I advertise my services in Dallas. I do “in-home” dog training for about $250 per visit. That means I need to see only 8 clients per month. My cost of advertising and driving is $500. So, technically I need to see only 10 clients per month. I generally see 2 clients in a day. Thus I work only 4-6 days per month! 3. Because I can control my income by choosing how many dogs I train, I can keep my net income down to around $2,000 per month. This is important because it allows me to have essentially no income taxes and get massive Obamacare credits for my family’s health insurance. 4. I didn’t vote for Obamacare. I, personally, think it’s bad national policy. But it’s the law of the land, and for a family of three with a taxable income of $24,000 per year our Silver Level plan through Blue Cross Blue Shield of Texas costs $13 per month. It’s a major benefit of being Poor on Purpose. 5. If I choose live in a place with very low property costs—such as East Texas where land sells for $3,000 per acre, if I live in an OLD mobile home with a property tax value of $3,500, if I pay cash for cars instead of buying new, if I allow my farm to partially feed me and entirely entertain me, then it turns out that I need very little money to live. My annual property tax is less than $350 per year, for instance. Earning ONLY $2,000 per month I still get $1,000 per month in disposable income. How can I spend it? First, I can build a rabbit house for about $1,000 and raise and sell meat rabbits. I could decide to buy some farm implements, like a tractor, and make a small payment of $250 per month for it over a few years. I could raise chickens, plant crops, or build small furniture pieces to sell locally or to “antique” shops in Dallas. I could also save it! Did you notice that the big city lifestyle in which I had to earn over $76,000 per year did not budget any savings? My friend told me, “It’s impossible to retire on Social Security alone.” He is right… IF you have a lifestyle that requires over $6,000 per month, then YES it is impossible to retire on Social Security alone. What if you have a lifestyle that requires less than $1,000 per month? I am 46 years old. If I want to replace a $6,000 per month income with payments from a 401k when I retire, how much would I need to save? Assuming I retire when I’m 70 and live until I’m 84, and assuming normal levels of inflation and returns on my investment… then answer is I would need a nest egg of about $1 million. To create that nest egg, I would need to save about $1,500 per month for the next 24 years. I will have saved about $400,000. With compounding, it will have grown to $1 million over that time. I could then extract both the interest and principal to live at HALF my high cost lifestyle in retirement. Please notice that the budget listed above did not include $1,500 per month in retirement savings. If I add that (even pre-tax) I need to earn $95,000. Do you know what percentage of households in America earn that much? Roughly 20%… less than 1 in 5. Alternately, with my Poor on Purpose lifestyle I can easily save $5,500 per year in a traditional IRA if I want to. That’s only $460 per month and it’s tax deductible, so it doesn’t affect my low income tax status. 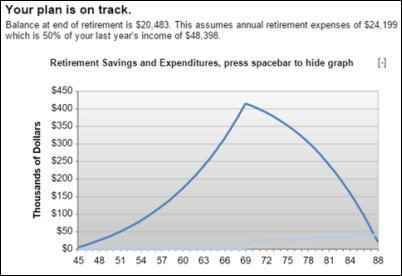 $5,500 per year until I’m 70 would create a nest egg of over $400,000. This will provide an income (without Social Security) of $24,199 per year until I’m 88. With a little Social Security I’ll receive even more for even longer. But Isn’t Being Poor Bad? Generally poor people have a difficult life. They are always broke. They might live on welfare. They are often seen as lazy or drug addicts. The difference between being poor and being poor on purpose is that the first group still has to pay high bills for housing, energy, food and the expense of working minimum wage jobs. The second group—poor on purpose—lives an easy lifestyle because they have “PRE-PURCHASED” housing, vehicles, energy, etc. I am Poor on Purpose because I focused all my energy, money, and time on getting out of debt, selling unnecessary assets, and pouring all my money into just a few assets: Land, Basic Home, Basic Transportation, Solar Energy. By doing that ONCE, I freed up my need for additional money for a LIFETIME. What is the Return for Being Poor on Purpose? Tons of leisure time to commune with nature through gardening, building, and living in peaceful surroundings. The ability to focus time on family, spouse and loved ones. Freedom to pursue alternative income sources and alternative lifestyles. Reducing retirement savings needs tremendously. With Obamacare, extremely low cost insurance premiums. The CHOICE to work or not work. I don’t know what the official definition of retirement might be, but I considered myself retired before I turned 45 years old. I do still work some, but it’s exactly on my own terms and timeline. The reason this is true is SPECIFICALLY because I decided to become Poor on Purpose. If I had chosen an expensive mortgage for my homestead, if I drove a brand new Ford F-250 instead of a high-mileage used Prius, if I had kept my high expense lifestyle even on my homestead, then I wouldn’t be financially independent. I wouldn’t be able to choose when and how I work. I wouldn’t get low taxes and low health- insurance costs. There are two ways to become “financially independent.” One, you could earn and save enough money to be rich then live off the interest. Two, you could lower your cost of living down to minuscule amounts so you don’t need very much money. I chose the latter. These things are a choice. Many people never think of it that way. They think, “I must work harder each year to make more money each year to afford a better lifestyle each year. That’s America!” However, many homesteaders have chosen exactly the opposite. We strive to require less money each year so we can have more leisure time each year so we can enjoy our lives today, at any age, surrounded by nature. 1. FREE HOUSING: Instead of staying in a high-mortgage/rent environment in the city we sold everything we could and bought a cheap 10-acre homestead in the country with a small mobile home. Even with a small mortgage of $800 per month it could be paid off in less than 5 years. Then NO RENT forever. In 1950 the average house cost $8,000. It wasn’t a 2,500 square foot, stone-faced land-barge with marble top counters. Yet, somehow people managed. 2. NO CAR PAYMENTS OR EXPENSIVE INSURANCE: Car payments not only cost the payment (with interest), they also cost full-coverage insurance. There are plenty of $3,500, or less, cars available that are reliable for at least two more years. With a car that cheap which I will own for a short time I don’t need full-coverage insurance. I can self insure. After two years I can sell the $3,500 car for $1,500, add $2,000 to it and buy another $3,500 car. The average cost of a new car today is $33,000. 3. REDUCE ENERGY COSTS: Electricity and heat are two lifetime costs that go up with inflation. The more energy efficient I become, the easier my life gets. I lowered my electricity bill to less than $30 per month in winter and less than $80 in summer. I live in Texas where air conditioning is required six months each year. I stopped using the central AC and went to three individual window units. I turn the unit I need on for the area I’m in. The others stay off. That saved me at least $100 per month in summer. I installed a wood-burning stove for winter heat. That saved me at least $100 per month in winter. I also conserve in other ways. It’s not hard. 4. STOP SPENDING MONEY: When I lived in the city, our main entertainment was spending money. Life was actually boring in our suburban house, so we would go to stores and buy things like lawn furniture, restaurant meals, movies and activities, clothes we didn’t need, etc. The homestead is not boring! I have rabbits, chickens, goats, a tractor, gardens, fruit trees, neighbors, and more. I don’t need to spend money to entertain myself. Look at your bank and credit-card statements. Now remove every unnecessary purchase. How much did you save? I, personally, saved over $1,000 per month. 5. WORK FOR YOURSELF: Not everyone can do this, but self-employment is a huge money saver. Working for someone else is a big expense. The expenses include driving to work every day, eating lunch out, clothes and clothes upkeep, having a nice car to park next to all the other nice cars in the parking lot and more. On average it takes $1.30 worth of work to bring home $1 when you work for someone else. When you are self employed you get tax breaks for driving your car, health insurance, and much more. Plus you only have to work when you need to, not 8 AM to 5 PM every day of your life. Pet Smart pays a dog trainer about $10 per hour. I make over $100 per hour working for myself. This is true of many jobs. 6. MAKE YOUR OWN FOOD: If you buy a piece of pie at a restaurant with coffee and a tip it will cost $9 just for one piece. If you buy a whole pie from the grocery store it will cost $6 or more. If you MAKE a pie it will cost about $1.50. There is a huge difference between buying a piece of pie for $9 and making an entire pie for $1.50. That pattern repeats itself over and over when you have the time, energy, and interest to make your own food. If you also grow some of your own food then the cost of eating can go down dramatically. I raise meat rabbits, chickens for eggs, goats for milk, and gardens for veggies. It’s fun, it gives me something to do that doesn’t cost money, plus it’s very relaxing. 7. LIVE IN A LOW COST AREA: Moving just 2 hours outside of Dallas lowered the cost of land from impossible-to-buy to $3,000 per acre. Had I gone 3 hours from Dallas I could have bought land for $1,800 per acre. Living in a big city is expensive from rent to taxes to tolls. Plus, rules and lack of land takes away opportunities to reduce your required income even more through raising animals and gardening. Finally, living in a low-cost area reduces the need to “keep up with the Joneses.” In downtown Dallas, every 5th car is a luxury car. In the country, every 5th car is an old, dented pick-up truck. That is how I became rich by becoming poor on purpose. Right now it is 2:21 pm on a Wednesday in early September. I spent the morning working in my rabbitry. I changed the oil in my Prius. I am planning how to seed my oat field this week before the rains come. My wife just padded into the room with a few chicken eggs for the refrigerator. For dinner we will eat food that we grew including rabbit or chicken then sit on the porch and watch the sun set. Where is my friend? He is in the bowels of the 84-acre Texas Instruments building complex in North Dallas, doing computer engineering. In a few hours he will enter gridlock traffic to drive to a high rise apartment. Since he won’t get home until 6:30, at the earliest, he will probably change clothes and go to a restaurant to eat a $60 meal. He will watch some TV, go to sleep and get up in the morning to face more rush hour traffic and do it all over again. He is “rich.” He makes a low six figure income! I read an article last month that Texas Instruments will be selling that campus and laying some people off. In 1995 Texas Instruments had 60,000 employees. Today they employ less than half that many. The final reason to be Poor on Purpose? You never know when your employer might make you poor by accident. I’m sure my friend will be fine… I hope he will be fine… will he be fine? What happens when you have a high-income lifestyle without a high income? I, personally, would rather be poor on purpose.